Trying to lose weight — whether it’s a little or a lot — can seem like an uphill battle. It oftentimes seems like our everyday lives stop us from having the tools we need to achieve our weight loss goals. Your work schedule is slammed, the kids have practice after school, and by the time you all get home, no one has the energy to make dinner, so you’re ordering a pizza. Who has time for healthy meal prep when you’re this busy? Unfortunately, you’re not going to lose weight if you can’t make healthy choices, and healthy choices are much harder if you haven’t planned for them. Therefore, one of the best ways to lose weight is to make it easier to make healthy choices by meal prepping. The hardest part about healthy meal prep is gathering up the motivation — and perhaps also the intimidation factor. When you look up easy meal prep ideas, it often shows Tupperware container after Tupperware container full of the exact same meals, perfectly portioned and separated. Meal prep for weight loss doesn’t have to be complicated or fancy. It can be extraordinarily easy. At Houston Weight Loss, we understand that life has a lot of built-in barriers for our clients to lose weight, but we think healthy meal prep doesn’t have to be one of them. Here are the basics: easy meal prep for beginners. Meal prepping is the simple act of planning and preparing meals ahead of time. It’s a broad term in that, how one decides to food prep is completely up to the individual person’s needs and time allowances. If you have the time and motivation to prepare an entire week’s worth of dinners ahead of time, that’s excellent. But many people won’t have that kind of time, so they may choose a couple dinners to partially prep and make breakfast for the entire week instead. This could also involve partial meal prep. You could decide to cook something that takes a long time on a day when you have the time, as opposed to doing it after work. Something like baking chicken and making brown rice — this alone could save you an hour on a tightly packed day and could be the difference between getting takeout and eating a healthy meal. One of the biggest barriers to successful (and lasting) weight loss is the wealth of unhealthy choices laid before us each day. Someone might bring bagels or donuts into work and leave them in the kitchen to share with the staff. You might pass any number of fast food restaurants on your way home from work after a long day — or perhaps you work in a restaurant and are surrounded by delicious (albeit unhealthy) food all day long. While some people hope exercise will be enough to help them lose weight, that’s not often the case. In order to lose weight, you have to consume less than you burn, and it’s far more difficult to burn the calories necessary to lose weight through exercise alone. Let’s remember that you must create a 3,500-calorie deficit to lose a single pound. That means burning 500 more calories than you’re eating and drinking every single day. Realistically, burning 500 calories during every workout is tough. Not only is that time-consuming, but most people won’t have the energy or motivation to exercise that much. Dr. Holly Lofton told Women’s Health Magazine that if you tried to lose a pound per week only through exercise, you’d have to run between seven and ten miles per day. That’s what it takes to burn about 500 calories during a workout. So even if you run an average 10-minute mile, you’re running for at least 70 minutes every single day. To achieve the necessary deficit, it’s much easier to adjust your diet and add in three to four days of exercise. It’s typically recommended that you follow the 80/20 rule: make caloric cuts 80% of your deficit, and exercise the other 20%. For example, you could plan on creating a 400-calorie deficit each day (totaling 2,800 for the week) and then leaving the remaining 700 to exercise. That would mean burning about 200 calories per workout if you exercised three days a week (slightly less if you spread it out over four days). This equation is exactly why food prep is the secret to weight loss and management. Cutting those 400 calories per day is much easier with some healthy meal prep. By planning ahead and taking steps to surround yourself with healthy food choices, you’re setting yourself up for success. You’re reducing the possibility of impulsive decisions during the course of your week — because let’s face it: that cake donut with sprinkles looks really good, and if you’re even the slightest bit hungry at 3:00pm, you’re going to reach for it. But if you’ve done all your healthy meal prep, your meals are planned, your snacks are ready, and you already know what your cheat meals are going to be, so you’re more likely to stick to the plan so you can really enjoy dessert Saturday night without guilt. Meal prep for weight loss doesn’t have to be complex or gourmet or even dozens of uniform containers laid out on a table (although, if you have the motivation to do it that way and it would help you, go for it). Healthy meal prep can simply mean planning ahead — maybe pre-organizing ingredients early or cutting up vegetables for snacks. The best part about food prep is that it’s completely customizable to your situation and the diet plan you’d like to follow, be it keto, Mediterranean, low-carb, South Beach, or Atkins. The more meals you plan, the more likely you are to stick to them. Decide what you’re going to have for all your main meals, in addition to your snacks. It might take a bit of time, but the more you do it, the quicker it will go. If you can’t manage every single meal, start with one meal and expand once you’ve gotten the hang of it. Make sure you write it all down. Better yet — log it all into your food tracker (like MyFitnessPal or Fitbit). You can always make amendments later, but at least you’ve set a plan for yourself. If your app won’t let you log food days in advance, do this every morning. For some people, the most difficult meal is dinner because they feel like they can cheat a bit after a good day of healthy, well-portioned eating, or because they have multiple people to feed. For others, it’s breakfast because they’re in a hurry, so they grab whatever they can reach with one hand as they run out the door (which is typically pre-packaged and carb-heavy). Let’s say breakfast is your toughest meal. When you’re feeling motivated, you make yourself a smoothie, but when you’re in a hurry, it’s cereal. You definitely never have time to cook anything. So why not take all the questions out of your morning routine? There are tons of recipes for breakfast food prep — you could waste an entire day on Pinterest looking at all of them. One of the most popular is egg muffins because they’re simple, quick and healthy, and you can customize them to your tastes. You simply whisk the eggs together (most recipes call for 10-12 eggs), add salt and pepper to taste, plus any small diced veggies (like onions or peppers). Spray a muffin tin with nonstick spray (or use muffin liners) and pour the eggs evenly in the tin to fill each cup about halfway. After that, drop in any other veggies (like spinach) or cheese. They’re typically cooked at 375 or 400 degrees for about 10-20 minutes (depending on your oven). And that’s it! After they’ve cooked, portion them out into their own containers. Breakfast is ready for the whole week. After you’ve got the most difficult meal out of the way and you feel comfortable with your healthy meal prep thus far, pick another meal. For this example, let’s move on to dinner. Dinner is sometimes trickier, especially if you’re feeding kids (they’re not necessarily willing to eat the same thing every night). But again, sitting down once a week to plan out your meals will make the whole process easier. Let’s say Tuesday’s dinner is lemon chicken with brown rice and veggies. On Sunday (or whatever day is most convenient for you), bake the chicken and cook the rice. The veggies will be easy the day of — especially if you bought them frozen in a steamable bag. If Wednesday’s dinner involves soup, cut up all the veggies while your chicken is cooking and divide them into Tupperware containers (according to how they should be added into the pot) so all you have to do is throw them in. As you expand your food prep to additional meals and snacks, it will get easier and easier to plan. You’ll feel more confident, and the weight you lose will motivate you to keep going. Before you know it, your healthy meal prep will simply be a part of your routine. Weight loss is largely about consistency. If you eat well one week, but fall of the wagon the next, you’re not going to see consistent weight loss. The most important part about meal prep for weight loss is that you make it a habit, which is why we recommend you find a way to make it easy, and customize it to your lifestyle. Taking an entire Sunday to cook and create dozens of Tupperware containers isn’t something everyone can do, but they can probably find a bit of time to make a week’s worth of salads for lunch, or peel and chop carrots for snacks. Healthy meal prep can be easy, no matter what diet you want to follow. At Houston Weight Loss, our goal is to provide you with the framework you need to achieve your goals, no matter what that means for you. 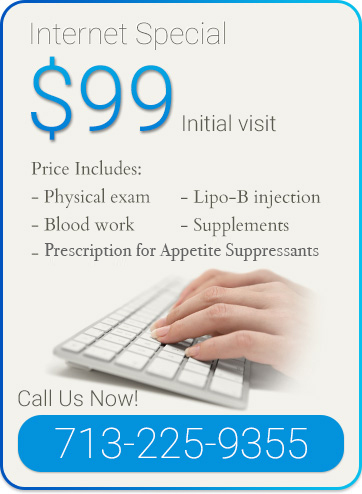 We can help you with accountability, appetite suppression, meal plans, and weight loss counseling. If you’re struggling to lose weight and need some help achieving your goals, get in touch with us today. We’d love to talk with you and explore your options!